For 5 months this summer I spent time with three local farmers that produce goods for local farmers’ markets, local restaurants and Community Sponsored Agriculture (CSA’s). 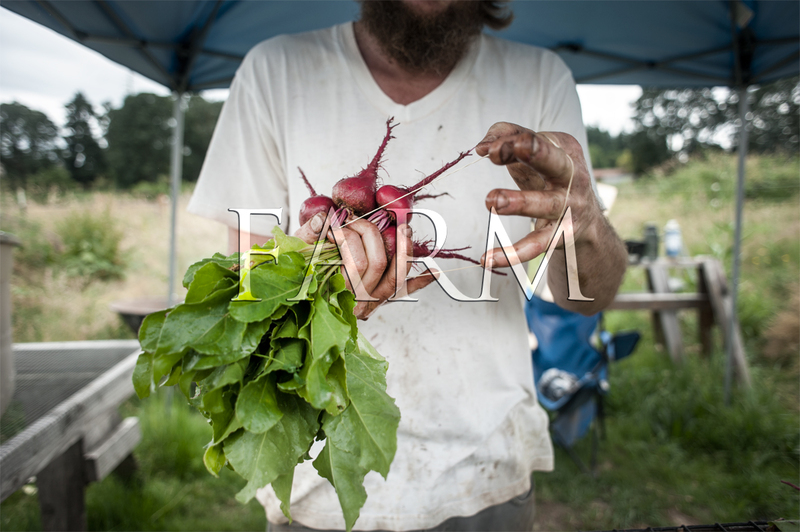 Carrie Sendak, Mama Tee’s Farm, worked backyards and smaller plots around NE Portland and SE Portland while Ted and Laura, Split River Growers, and Grey Horton from Morgans Landing Farm, work land that is on Sauvie Island. Before this project my knowledge of farming and especially locally sourced produce consisted of shopping at New Seasons and Whole Foods, the occasional trip to a farmers’ market and a myriad of articles I had read on the benefits of sustainable agriculture. I understood the arguments for reducing the carbon footprint, for supporting the local community and for healthy, non-factory farmed fruits, vegetables and meat but I what I wanted to answer was, who are the people that do this for a living and why? Of interest is the size of some of the images. Using high resolution captures and printing at large scale, I am trying to create a feeling of immersion. Capturing each person in their environment in a way that puts them in perspective with their surroundings.